Who is promoting your company? With Olympic success the talk was suddenly all about a collective pride in Team GB rather than our normal slightly apologetic attitude. In business we cannot afford to wait until we are successful before we become proud. Each one of us represents the brand in some way each day and the level of consciousness with which we do that can dramatically influence the way others see our business. The effort we put into living and extolling the values our brand stands for is critically important. Let me give two real-life examples I have encountered in the last two days. If they can't get this right, what are the engines like? Firstly, an email sen t in haste to the chief executive of a major organisation referred to “our next work” instead of “network”, and contained other grammatical errors. On one level these are minor details, but there is an old saying in the airline industry that finding rubbish in the literature pocket makes passengers worry about the state of the engines. 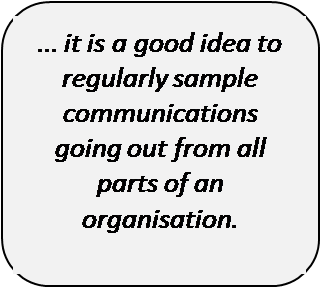 How does that CEO perceive the sending organisation now? Secondly, listening to individuals at a government-sponsored reception, most answered the question “what do you do?” literally, saying little about their company. Nobody likes a boastful bore but justifiable pride is very different and finds respect. In my experience, the people who do this most naturally are the technical consulting team who can often secure follow-on business through infectious self-belief in what they do. Vision and mission statements are important and need to be clear, but the real payback comes in communicating what we are really about effectively and consistently – not just in media releases but in letters, emails, formal speeches, casual conversations and so on. We think it is a good idea to regularly sample communications going out from all parts of an organisation.This is to advocate common sense rather than censorship - the bottom line is that we are all responsible for promoting the company.